My father has worn the same belt ever since I was a boy. Its a weathered tan color with a huge brass loop buckle. It’s beat up, gnarled and old. I love it. I remember the first belt I purchased in high school, it was “genuine” leather. It’s held up in the 10 years I’ve had it, but not gracefully. The leather is cracking and there’s a strange film peeling off the surface. I tossed it and resumed my search, where I came across a worthy contender, the Sandlot Goods Men’s Belt in Horween Rio Latigo. Sandlot Goods was founded in 2013, but judging by their design and craftsmanship you’d think they’d been at it since 1913. With a passion for yesteryear, hot summer days spent playing baseball, and cool nights catching fireflies, Sandlot Goods aims to capture the spirit of simpler times in their products. Of course everything is proudly handmade in their Kansas City studio. The belt itself is 1.5″ wide and features solid brass hardware. The buckle and keeper are secured in place using large rivets. The Sandlot emblem is located at the end of the belt and Made in KC is branded behind the buckle. Edges are beveled and notches are set 1″ apart. Did I mention Sandlot also backs up all their hardware with a lifetime warranty? A belt is a belt is a belt, right? Sometimes. Sandlot Good’s Horween Rio Latigo belt will keep your pants up. But thanks to the 1.5” strap it will do more than keep your inner plumber from emerging. You could holster tool pouches and firearms from this and not worry about your belt caving in. So if you’re the Batman utility belt type, this belt will work for you. The only issue I had difficulty with was getting the end of the belt through the leather loop. But like a new baseball glove, you gotta work it a little to get it just right and I suspect that issue will resolve much the same way. 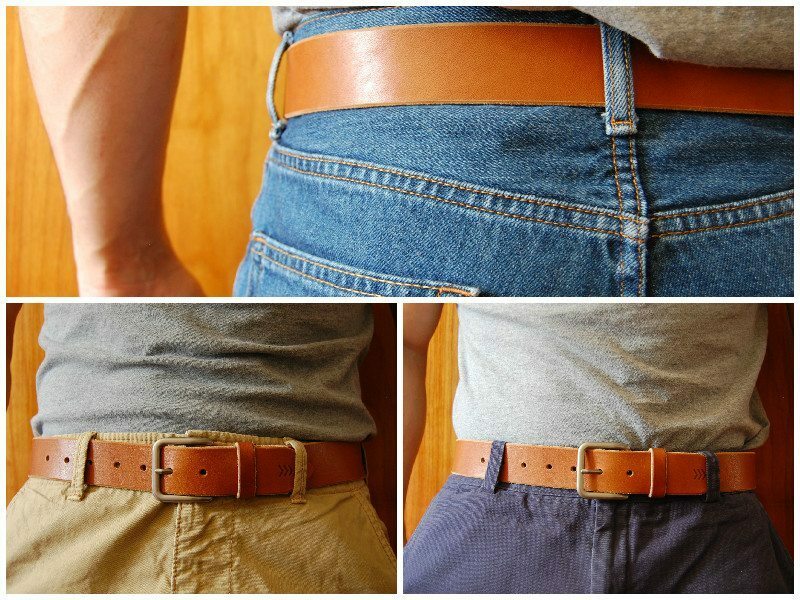 Versatility is important with belts. The Rio Latigo coloring goes great with a vast variety of pants and shorts. I normally don’t tuck my shirts in, but I just can’t let that solid brass and Horween leather go unnoticed. Keep in mind, Sandlot also offers this belt in Horween Black Chromexcel if you need something more formal. The rough edges offer a subtle contrast from the latigo finish that give the belt just the right amount of character. Sandlot Goods Men’s Belt in Horween Rio Latigo is a bombproof belt that looks great from all angles. The combination of top quality leather, riveted construction and brass hardware mean you’ve got a belt that will simply last. Competitively priced at $90 dollars makes it a solid investment as well. 1 Comment on "SANDLOT GOODS MEN’S BELT – HORWEEN RIO LATIGO – $90"